The Shortest Sea Route between mainland Britain and Ireland, the twenty mile crossing between Stranraer and Larne, was a jewel in any railway crown. 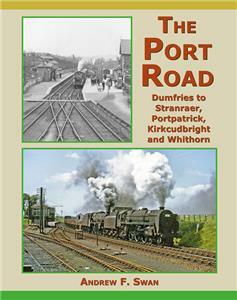 Eighty-one miles of largely single track railway were built from Dumfries through inhospitable, barren uplands to Stranraer. The Caledonian Railway operated the line for the first two decades but then joined with the Glasgow & South Western, the Midland and the London & North Western railways, each buying a quarter share to create, in 1886, ‘the Jointest of All Joint Railways’. The Scottish companies operated the line and took alternating responsibility for its upkeep. Passengers, the Royal Mail, goods and considerable war-time traffic mixed with stopping local trains. The line was operated with a variety of pre-Grouping rolling stock, signalling and motive power rarely seen. Within these pages, Andrew Swan outlines the history of the line and its branches, and gives a detailed description of each of the stations along the route, with a 32-page section of buildings and rolling stock plans all in colour. Further chapters cover train services, signalling and some of the staff who worked on the line. Railway enthusiasts, modellers and anyone interested in local history will find much to enjoy in this lavishly illustrated book.